Leaving soggy, non-stop rainy place in Port Edward was a wonderful relief. 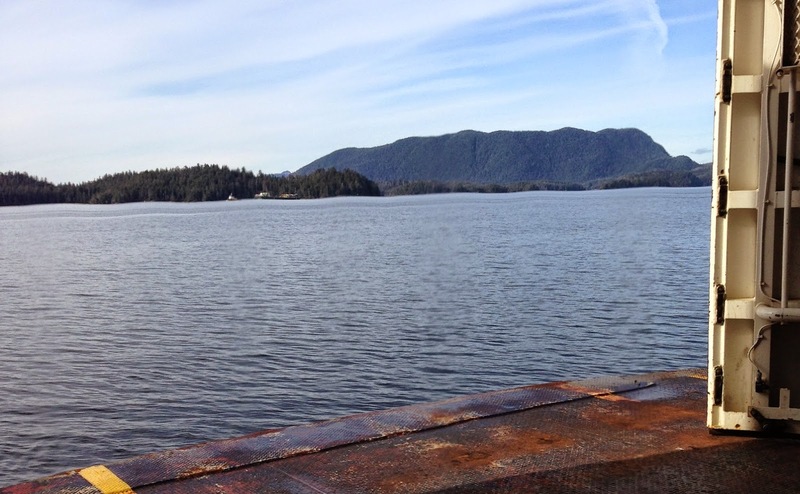 So headed to Prince Rupert – only about 16 clicks from Port Edward. 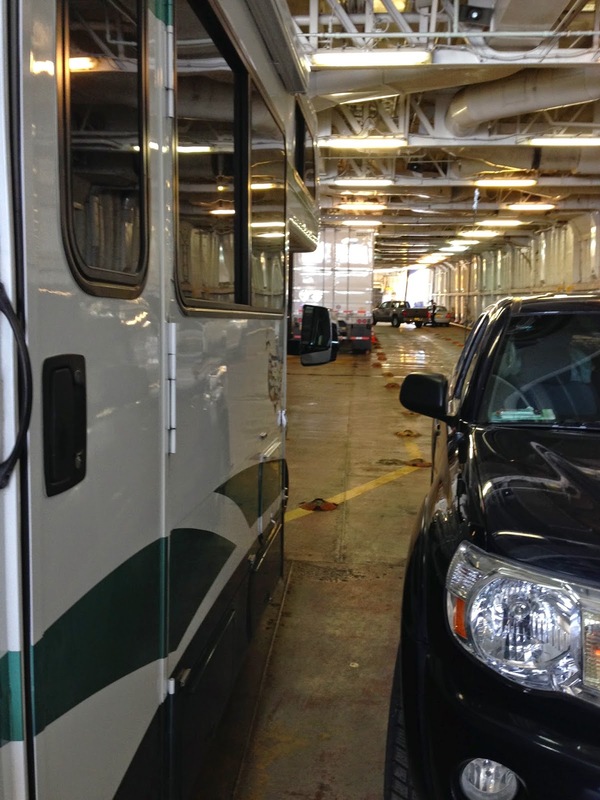 I checked into the Alaska ferry terminal on October 6th, got measured, tickets, custom declaration form, cats tickets. And its not raining!!! Wow! So once done with this, went and parked on the street overlooking the port. I was the only one there that early. As it turned out for such a late time of the season, there were only 20 vehicles heading north out of Prince Rupert. Its always a little confusing to me when I do the ferry. You are given times when one will load, etc, except that the times are Canadian or are they Alaskan times? You think you get a handle on this… but it trips everyone up. 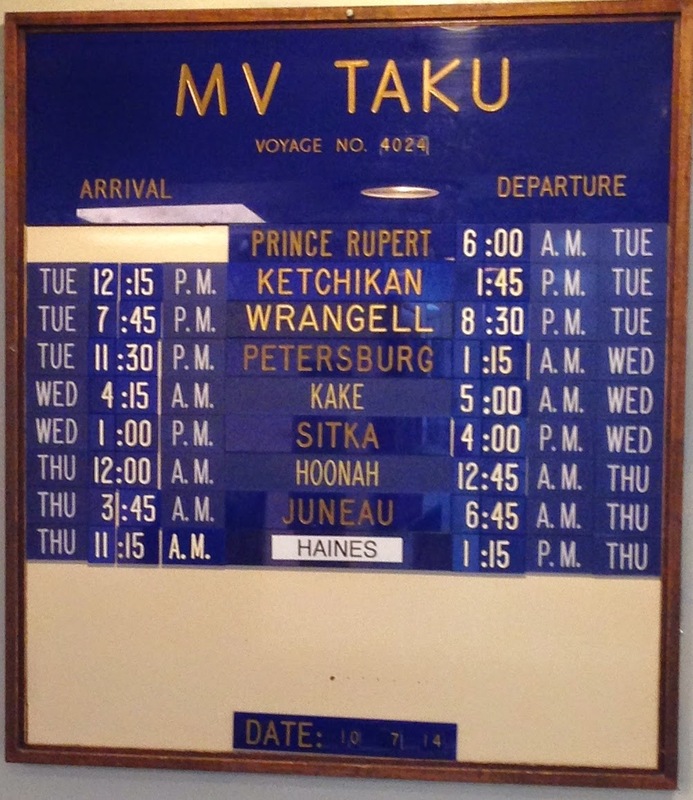 The ferry is on Alaskan time, not Canadian time, the terminal is Canadian time. Fine and dandy you say. Well… depending on whether they are on summer schedule or on winter schedule – you need to know when to be at customs and ready to go. I was told they would come get us at 1 am – to double check all paperwork is completed, etc and to get into place at the terminal. One o’clock came and went… nothing. Two o’clock came and went… About three o’clock – folks started showing up at the terminal. Can’t see if ferry is in from my angle. The few folks that had parked with me on the street, but had not checked in informed me they (Canadian ferry people) would not be coming up to us, but we need to go down there. Uh? That’s never happened before. Ok. Wake up, head down and park in a lane for customs. And wait. And wait… nearly 5:30 in the morning, customs shows up and we finally make our way thru. Told which lane to park in for loading. Do so and wait… and wait… and wait. Its a quarter to 7 in the morning that I finally get loaded onto the ferry oh wait, is that a quarter to 6? The ferry left 15 minutes later. Gads! 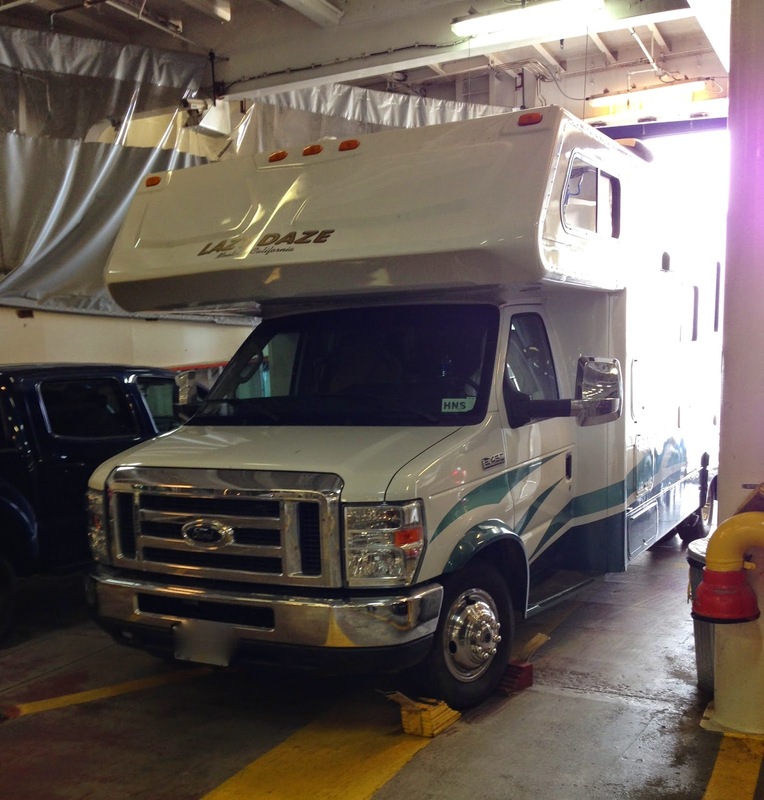 I crashed, went to bed once I made it to my berth on the ferry. Did this for two reasons… see the schedule above… that 6 hours between Prince Rupert and Ketchikan… other then the last hour, it is wide open water, not protected by the islands. Big rollers…. I prefer to sleep thru that…. and second reason… I needed solid block of sleep. Its exhausting doing hurry up and wait stuff. Once again, Ketchikan was sunny for me. This being one of the rainiest places on earth, I bring them sunshine each time I pass thru.. a good omen. The trip north – the waters were so smooth one would have thought we were on a lake versus the ocean. So took this late afternoon shot as we approached the narrows to show you how smooth the water and our trip north was. In the Fall, this is downright rare site to behold. As it is, the day after – special winter warnings were issued all up and down the Inside passage. I couldn’t have been more lucky. It can be a wild ride when its stormy. I was parked at edge of ferry, this was the view out behind my rig. Beautiful day in Sitka, I would have normally gotten off and gone exploring, but I had not spent time with my boys since Ketchikan, so I spent time with them. After Sitka, the next place I had acknowledged was at Hoonah. It was night, but the moon made it so very special to be out on the water with the surrounding mountains. Gosh, it was just gorgeous, but my pictures did not do justice to what I was enjoying. 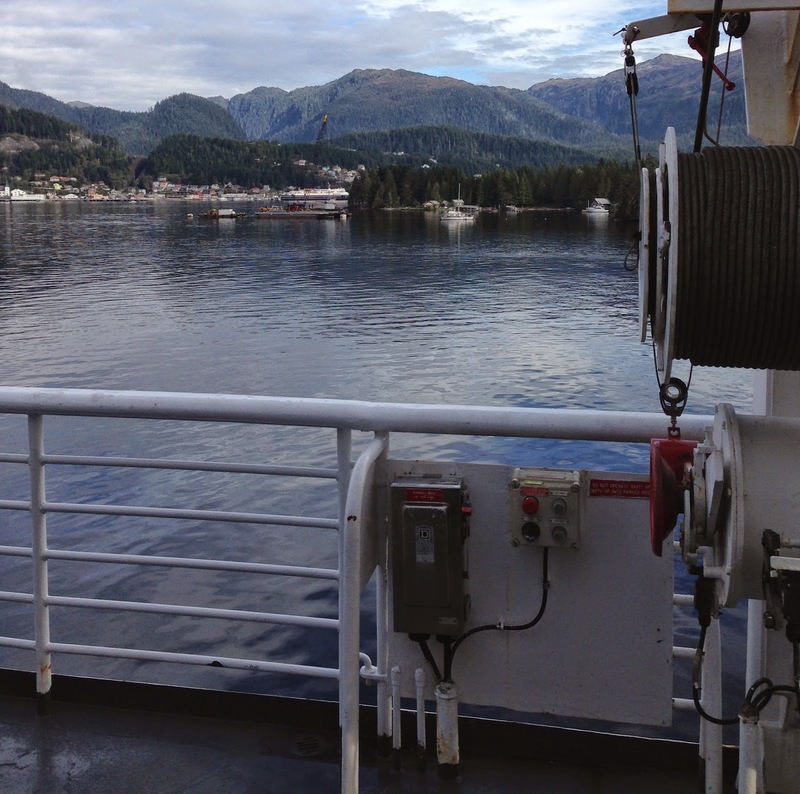 Then, I did not awake until we were leaving Juneau, so missed seeing Auke Bay, etc. As it was, the weather turned sour. All one could see was fog and water. As we got closer to Haines the wind picked up and it was snowing… yes, it was indeed snowing. Got off the ferry and the snow turned to rain. Got quite a welcome from my friends… my amazing friends. They managed to move the entire contents of my storage unit into my apartment before I got there. I can’t see my apartment for all the stuff, but its big! Wow! I got the boys moved into the place… play time. Let them explore while I went and topped off propane, gas, got pink anti-freeze and started unloading my stuff out of the rig. Problem with unloading the rig – there’s no place to put it into the apartment that’s packed to the rafters. But I got to start somewhere… I got the rig winterized too in the midst of all this. So I am almost done removing all liquids, foodstuff, toiletries, clothes from the rig. I have doggedly pursued this as the weather is changing daily now, getting colder… I think I will master the last of this tomorrow. I am fortunate that I can park my rig behind this apartment complex, within view of my apartment no less. I will try to get photos for my next posting. In my short time here, I have unpacked, separated out, put away – 7 china packs, 8 mirror packs. I say separated out as what I know I absolute do not want and will be sold or thrown away is pulled out immediately. I have even pulled out my favorite storage containers and have put them into my rig to get them out of the apartment. I now need to make a run to recycle center to rid myself of all the empty and flatten boxes and white paper, so I can continue with the task at hand. So no more unpacking until that is done. So the big chore is to set up the kitchen – where to put things, I don’t know what to do with all this space!!! Wow, what a trip! Hope all works out as planned. Take care. It was a great trip north! I'm jazzed by this opportunity to tackle this downsizing, a little surprised by my reaction but hey, I am so much in the mindset to get it done, it shall be done. Glad all going good so far and sure it's nice to have more room you probably been dancing all over the place LOL. Take care. You were here in Ks. this time last year. Oddly Janie, the more room is intimidating. I was very content with my small space in my rig. It may get better as time goes on, but right now its a little too much with all this space. Amazing year as gone by since I saw you guys. Good memories were made and shared!